Baby Blue Eyes Spruce is a beautiful and uniquely colored dwarf form of the Colorado Blue Spruce. The needles of Baby Blue Eyes is silvery blue to almost gray needles that are stiff and bristly. They retain their color through winter. It will grow slowly to 10'15' and 8' to 10' wide. Baby Blue Eyes will tolerate dry locations once established. With some light shade, the blue will be a richer color. Use this tree as an accent or best use is as a specimen. It is deer resistant. 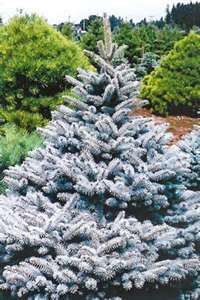 Baby Blue Eyes Spruce likes to be planted in full sun or partial sun.